HOUSTON – This Memorial Day weekend, while many Americans roll our their barbecues and soak up some sun at the beach, nine astronauts orbiting above Earth in the International Space Station will be spending their holiday weekend hard at work. The massive orbiting laboratory is currently home to three station astronauts – Ron Garan of NASA and Russian cosmonauts Alexander Samokutyaev and Andrey Borisenko – and six visiting astronauts who are carrying out the final mission of the space shuttle Endeavour. Shuttle commander Mark Kelly, pilot Greg Johnson and mission specialists Andrew Feustel, Mike Fincke, Greg Chamitoff and Roberto Vittori, launched into orbit on May 16, and docked at the space station two days later. "Nobody has voiced any special plans," NASA spokesman Kelly Humphries told SPACE.com. "There's an Endeavour Tribute event at 12:56 a.m. CST Tuesday, and it wouldn't be out of line to expect something patriotic then if they missed the opportunity Monday." As for the ground teams here at Mission Control in Houston, the flight controllers have no big plans either, "other than showing up for work," Hassmann told SPACE.com. The shuttle crew is entering the homestretch of a 16-day mission to deliver a $2 billion astrophysics experiment and other supplies to the space station. But even as the flight winds down, there is still work to be done before the astronauts make their journey back to Earth. NASA astronaut Andrew Feustel, STS-134 mission specialist, participates in the mission's firstspacewalk on May 20, 2011 as construction and maintenance continue on the International Space Station. Earlier today (May 27), Fincke and Chamitoff completed the mission's fourth and final spacewalk. The outing, which lasted 7 hours and 24 minutes, was also the last ever spacewalk conducted by shuttle astronauts. This holiday weekend, the astronauts will continue to unpack all the cargo for the station that was brought up on the shuttle. Endeavour hauled a load of hardware and spare parts to the orbiting laboratory in an attempt to leave it in a good position following the end of NASA's space shuttle program this year. Only one final shuttle flight remains after Endeavour's mission – the STS-135 mission of the shuttle Atlantis in July. 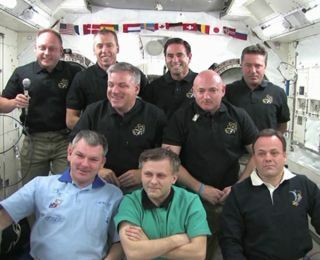 Early Sunday morning (May 29), Endeavour's crew will make final preparations for their departure from the space station. A farewell ceremony will take place at 6:56 a.m. EDT (1056 GMT) before the hatches between the station and the orbiter are sealed. Endeavour is scheduled to undock from the space station on Sunday at 11:53 p.m. EDT (0353 May 30 GMT). The STS-134 mission is the 25th and final flight of Endeavour before the shuttle is retired along with the rest of NASA's orbiter fleet later this year.